Tiger-Cats quarterback Zach Collaros appeared outside the locker room Tuesday, clearly "bummed" by his season-ending knee injury. Hamilton Tiger-Cats quarterback Zach Collaros appeared outside the locker room Tuesday, clearly "bummed" by his season-ending knee injury. But he said he wants to be around the Ticats after his surgery to offer moral support. With a 9-month rehabilitation expected, he said he plans to be back at training camp next summer. "I was bummed, I'm still kind of bummed, you know?" Collaros, 27, said. "We were having a great season — we're still going to have a great season. But everything felt like it was clicking. I was bummed." 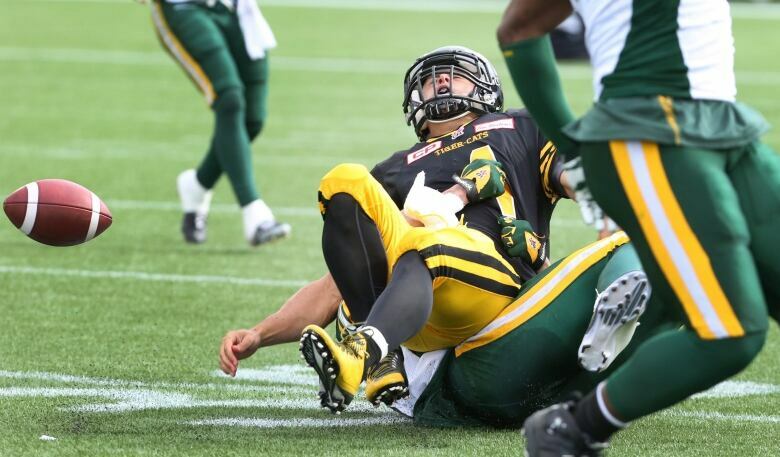 Collaros – who leads the league in passing yards with 3,376, and in touchdown passes with 25 –suffered a torn ACL early in the second quarter of Saturday's 25-18 loss to the visiting Edmonton Eskimos at Tim Hortons Field. "I'd never experienced anything like it," Collaros said Tuesday. "I've never had a serious injury. The concussion last year was probably the most I've ever missed time for. And I'd never felt anything like it. I knew something was wrong and I didn't know what. I was hoping it wasn't that, but it was." After the swelling goes down, he said he plans to have surgery and then roll right into rehab, in or near Hamilton. Collaros had nothing but optimism for what his replacement, rookie quarterback Jeff Matthews, is capable of, despite a rough series of plays Saturday after Collaros left the game. "He's a confident kid," Collaros said. "He's a strong kid. Got a strong arm. He's a smart kid. I personally think he's going to do an unbelievable job." Tiger-Cats quarterback Zach Collaros was knocked out of Saturday's loss to the Eskimos with a knee injury. On Monday, the CFL's leading passer this season was diagnosed with a torn anterior cruciate ligament in his right knee that will end his season. The Ticats said no date for surgery has been determined. Collaros also leads the CFL this season in TDs (25) and passer rating (113.7). (Peter Power/The Canadian Press) Collaros said he's hoping to play a role in the team's continued season. He's already been bending the ear of offensive coach Tommy Condell, he said. "I told Tommy I've been drawing up plays already," Collaros said. "I told Tommy as soon as the game was over, I said, 'Hey man, I want to have a role.'" Coach Kent Austin was asked how he took the news about Collaros's injury on Monday. "Oh, you can imagine — not well," he said. "But things happen. ... We'll carry on." Austin said suggestions he bring in a veteran quarterback to fill the hole Collaros leaves don't take into account the difficulty in integrating a new player into the team's offence, even down to understanding the terminology used. Sometimes familiarity with the team's strategy is more advantageous than someone with a lot of experience, he said. The team has a bye this week and has its next game against Calgary on Oct. 2. He said the coaching staff will use that extra time to prepare Matthews to be the starter.